In this category there are all the things you’ll need to help your clients to have the best Summer holiday ever! We stock many styles of headwear, as well as sunglasses, beach balls, and towels. These can be enjoyed by everyone and therefore has a wide and varying demographic. This means your advertising reach will extend further. Help broad target audiences to make this summer holiday even more adventurous and exciting with innovative giveaways. All of the products featured here can be personalised by having your corporate logo printed on the front. Summer themed promotional products will impress your customers and the fun times they had at the beach with their friends and family will then be associated with your brand. These will be even more greatly appreciated should the recipient have a family, who can enjoy these beach games and humorous glasses. Summer is sure to be memorable with these beach and sun themed merchandise. Your customers will love you for these products! Summer is right around the corner, and you’re searching for the right method to efficiently stay in mind of your target audience by using promotional beach products? Seasonal items are a great choice because they will meet the immediate needs of your customers. Everyone needs tools to help their holiday be the more fun and comfortable it can be. These include beach sunglasses and hats to keep cool in the sun. Time away is always spoiled when you get sunburnt! There are also water guns in this section, which as well as helping kids and adults to cool down, will also provide hours of entertainment. For those that want to participate in games but would rather stay dry we offer many promotional beach games such as frisbees, tennis sets and soccer sets. The fun and relaxation that your clients experience with these products will then be attributed to your brand. There is so much choice here that you’ll have a hard time choosing! There are flat caps and baseball style ones, which will help the wearer to keep cool on hot Summer days. There are also many styles of sunglasses some that are foldable too, meaning they can be conveniently carried in the pocket. There are lots of games too, which will easily keep both children and adults occupied! We stock kites, which can be flown across the beach via hand held strings. Logo printed beach chairs will be handy for those that want to sit on the beach but would rather not sit in the sand. 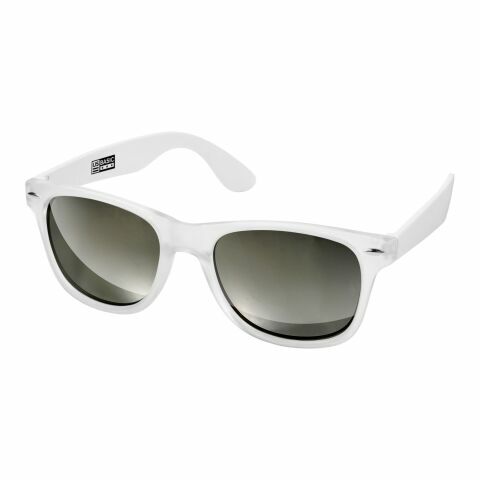 There is also a wide variety of sunglasses available, these stylish promotional products will be worn both on holiday and at home, spreading your advertising message far and wide. No matter what your marketing aim is, there’s sure to be a beach themed product here to suit it. The beach and sun products are definitely useful as well as recreational, this combination will ensure your clients use these items for many years. The longer they keep them; the more brand impressions will be made. The nature of these items also means they will appeal to all target audiences. These can be given out on a variety of occasions, at events and exhibitions, your business will be associated with fun and good times when people see these inflatables and beach games at your booth. The huge variety on offer means that there is something for everyone, whatever you choose to personalise, you can be sure these high quality products will be appreciated and regularly used. To use beach & sun products as promotional products is innovative and profitable, because you can be sure that this small present from you will definitely not go to the rubbish bin immediately like other giveaways! These are also inexpensive products, ensuring you can order in bulk without a huge financial cost to your business. Once you have chosen the style in your desired colour, you also have the option to have these personalised by having your corporate logo printed on the front. If you’re unsure of where to begin, or have any questions about the design process, please don’t hesitate to give our friendly team a call.